Oncoprotein Tax, encoded by the human T-cell leukemia virus type 1 (HTLV1), persistently induces NF-κB activation, which contributes to HTLV1-mediated T-cell transformation. Recent studies suggest that the signaling function of Tax requires its ubiquitination, although how the Tax ubiquitination is regulated remains unclear. We show here that the deubiquitinase CYLD physically interacts with Tax and negatively regulates the ubiquitination of this viral protein. This function of CYLD is associated with inhibition of Tax-mediated activation of IKK although not that of Tak1. Interestingly, CYLD undergoes constitutive phosphorylation in HTLV1-transformed T cells, a mechanism known to inactivate the catalytic activity of CYLD. Consistently, a phospho-mimetic CYLD mutant fails to inhibit Tax ubiquitination. These findings suggest that CYLD negatively regulates the signaling function of Tax through inhibition of Tax ubiquitination. Conversely, induction of CYLD phosphorylation may serve as a mechanism by which HTLV1 overrides the inhibitory function of CYLD, leading to the persistent activation of NF-κB. Human T-cell leukemia virus type 1 (HTLV1) is an oncogenic retrovirus that is etiologically associated with a human acute T-cell malignancy termed adult T-cell leukemia (ATL) [1–3]. HTLV1 genome encodes a 40-kD protein that not only regulates viral gene expression but also induces various cellular genes contributing to HTLV1-mediated T-cell transformation . Tax modulates the activity of different cellular transcription factors, most importantly NF-κB, a family of enhancer-binding proteins regulating cell growth and survival . The activity of NF-κB is normally subject to tight regulation by a cytoplasmic inhibitor, IκB. In response to cellular stimuli, IκB is phosphorylated by a specific IκB kinase (IKK) and targeted for ubiquitination and proteasomal degradation, resulting in nuclear translocation of active NF-κB [6, 7]. Under normal conditions, the activation of IKK and NF-κB occurs transiently, which assures that the expression of NF-κB target genes is induced temporally. However, in HTLV1-infected T cells, Tax persistently stimulates the activity of IKK, leading to constitutive nuclear expression of NF-κB [8–10]. Strong evidence suggests that deregulated NF-κB activation has a central role in HTLV1-mediated T-cell transformation [5, 11, 12]. We and others have previously shown that Tax physically interacts with the IKK complex via the IKK regulatory subunit IKKγ (also called NEMO), and this molecular interaction is critical for Tax-mediated IKK activation [13–15]. More recent work suggests that the signaling function of Tax requires its ubiquitination [16–18]. Although ubiquitination is traditionally viewed as a mechanism that mediates protein degradation in the proteasome, it is now clear that specific types of ubiquitination also facilitate the activation of protein kinases, including IKK . In particular, lysine 63 (K63)-linked polyubiquitin chains may serve as a platform that helps recruit and activate IKK and its activating kinase, Tak1. Like phosphorylation, ubiquitination is a reversible reaction, which is counter-regulated by ubiquitinating enzymes and deubiquitinases (DUBs) . A DUB, CYLD, has been shown to preferentially deconjugate K63-linked ubiquitin chains  and implicated as a negative regulator of IKK/NF-κB signaling. CYLD has constitutive DUB activity, but its activity can be rapidly inactivated via its phosphorylation in response to NF-κB stimuli . Tax undergos K63 type of ubiquitination, which is critical for activation of NF-κB . However, how the ubiquitination of Tax is regulated remains unclear. In the present study, we have shown that Tax forms a complex with CYLD, in which CYLD strongly inhibits the ubiquitination and signaling function of Tax. Interestingly, in a large panel of HTLV1-transformed T-cell lines, CYLD is constitutively phosphorylated. These findings not only establish CYLD as a negative regulator of Tax ubiquitination but also suggest a mutual regulatory mechanism in which HTLV1 stimulates CYLD phosphorylation and functional inactivation. A prior study suggests that Tax is preferentially conjugated with K63-linked ubiquitin chains . Since CYLD is a K63-specific DUB, we examined whether the ubiquitination of Tax is negatively regulated by CYLD. We first examined the potential physical interaction between Tax and CYLD. In HTLV1-transformed T cells, Tax was readily co-precipitated with CYLD, suggesting that CYLD is present in the Tax complex (Figure 1A). The Tax/CYLD physical association is specific, since a pre-immune serum did not precipitate Tax (Figure 1A). Furthermore, Tax also interacted with CYLD in transiently transfected cells (Figure 1B). Interestingly, the Tax/CYLD interaction appeared to be enhanced by the IKK regulatory subunit, IKKγ, which is known to interact with both Tax [13–15] and CYLD [24, 25]. The Tax/CYLD association was also suggested by their colocalization in the cytoplasm of the transfected cells (Figure 1C). Physical interaction between Tax and CYLD. (A) Cell lysates were prepared from the HTLV1-transformed C8166 cell line and subjected to IP using either a control pre-immune serum or anti-CYLD. The precipitated CYLD and its associated Tax were analyzed by IB. (B) HEK293 cells were transfected with HA-CYLD and Tax either in the absence (-) or presence (+) of IKKγ. The cell lysates were subjected to IP using anti-CYLD followed by IB to detect the precipitated CYLD and its associated Tax (top two panels). The cell lysates were also subjected to direct IB to monitor the expression of IKKγ and Tax. (C) HEK293 cells were transfected with HA-CYLD and Tax. The cells were stained with anti-HA (Y-11) and a mouse monoclonal anti-Tax antibody, followed with Texas red-conjugated donkey anti-rabbit Ig and FITC-conjugated donkey anti-mouse Ig. Cells were also counterstained with Hoechst 33258 for nuclear visualization. The expression of CYLD, Tax, Tax-CYLD merge, and nucleus (Hoechst) are shown. Note that the cytoplasmic, but not nuclear, Tax was colocalized with CYLD (Tax-CYLD merge, yellow color). We next examined whether CYLD regulates the ubiquitination of Tax. As expected, Tax was constitutively ubiquitinated when expressed in 293 cells (Figure 2A). The ubiquitin chains conjugated to Tax appeared to be predominantly K63-linked, since a ubiquitin mutant lacking K63 (K63R) was defective in mediating Tax ubiquitination, whereas the K48R ubiquitin mutant was competent in mediating Tax ubiquitination (Figure 2B, lanes 1 and 2). Furthermore, a ubiquitin mutant retaining lysine 63 but none of the other lysines (K63) was able to mediate Tax ubiquitination (Figure 2B, lane 4). Since CYLD is a DUB that specifically deubiquitinates K63 ubiquitin chains [21, 24–26], we tested whether the ubiquitination of Tax is subject to regulation by CYLD. Interestingly, the ubiquitination of Tax was strongly inhibited when it was coexpressed with CYLD (Figure 2C). The inhibitory effect of CYLD on Tax ubiquitination was dependent on its DUB catalytic activity, since a catalytically inactive CYLD mutant failed to inhibit Tax ubiquitination (Figure 2C). These data indicate that CYLD functions as a DUB that negatively regulates Tax ubiquitination. Tax undergoes K63 ubiquitination, which is inhibited by CYLD. (A) 293 cells were transfected with HA-tagged ubiquitin together with vector control (V) or Tax. Protein lysates were subjected to IP using anti-Tax, and ubiquitin-conjugated Tax and Tax were detected by IB with HRP-anti-HA and anti-Tax, respectively. (B) 293 cells were transfected with Tax together with the indicated ubiquitin mutants. Tax was subject to IP and ubiquitination assays as in A (left panel). Cell lysates were analyzed by IB to monitor ubiquitin expression (right panels). K48R and K63R harbor K/R substitutions at lysines 48 and 63, respectively. K48 and K63 harbor K/R substitutions in all lysines except 48 and 63, respectively. (C) HEK293 cells were transfected with Tax and HA-tagged ubiquitin either the in the absence (-) or the presence of wildtype (WT) CYLD or a catalytically inactive CYLD mutant (Mut). 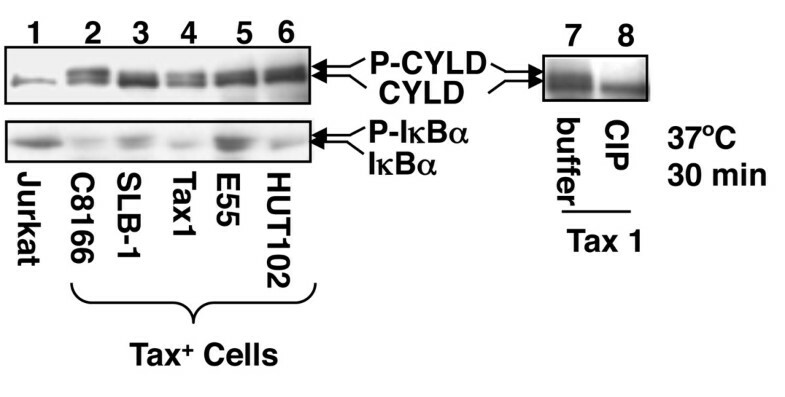 Cell lysates were subjected to Tax ubiquitination (left panel) and IB (right panel) assays. The Tax expression level was comparable between the different lanes (data not shown). IKK activation by cellular signals is known to require the MAP3K Tak1 [27–32]. Tak1-mediated phosphorylation of IKKβ, together with a ubiquitin-dependent mechanism, regulate IKK activation by the TCR/CD28 signals . We have previously shown that Tax stimulates the catalytic activity of both Tak1 and IKK , although the underlying mechanism remains unclear. Since CYLD deubiquitinates Tax, we examined the effect of CYLD on these Tax-specific signaling events. When expressed in 293 cells, Tak1 displayed a low level of basal catalytic activity as determined by in vitro kinase assay (Figure 3, panel 1). As expected, the kinase activity of Tak1 was potently stimulated by Tax, which was associated with activation of its downstream kinase IKK (Figure 3, panels 1 and 3). 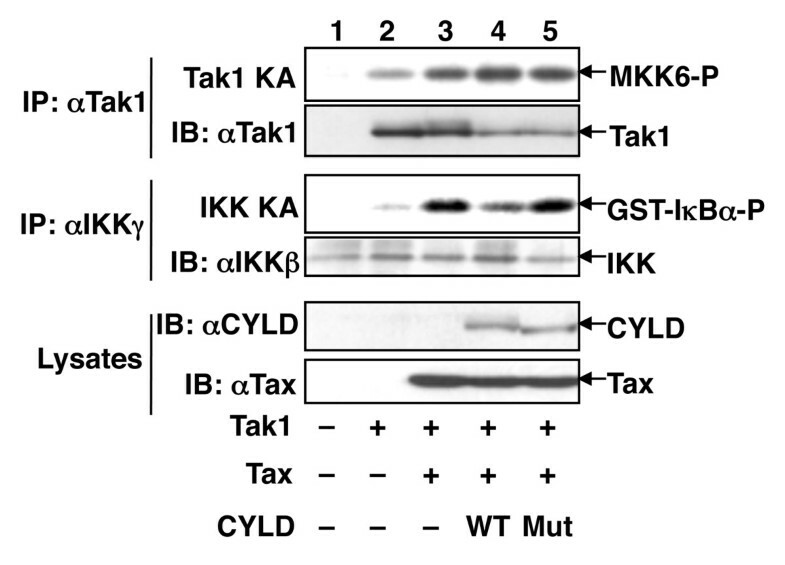 Importantly, expression of wildtype CYLD, but not its catalytically inactive mutant, strongly inhibited Tax-stimulated activation of IKK (Figure 3, panel 3), supporting a role for Tax ubiquitination in the activation of IKK signaling. However, to our surprise, CYLD did not affect Tax-stimulated activation of Tak1. Thus, ubiquitination is differentially required for Tax-mediated activation of Tak1 and IKK. This finding is also consistent with our previous observation that Tax-mediated Tak1 activation is required but not sufficient for IKK activation . 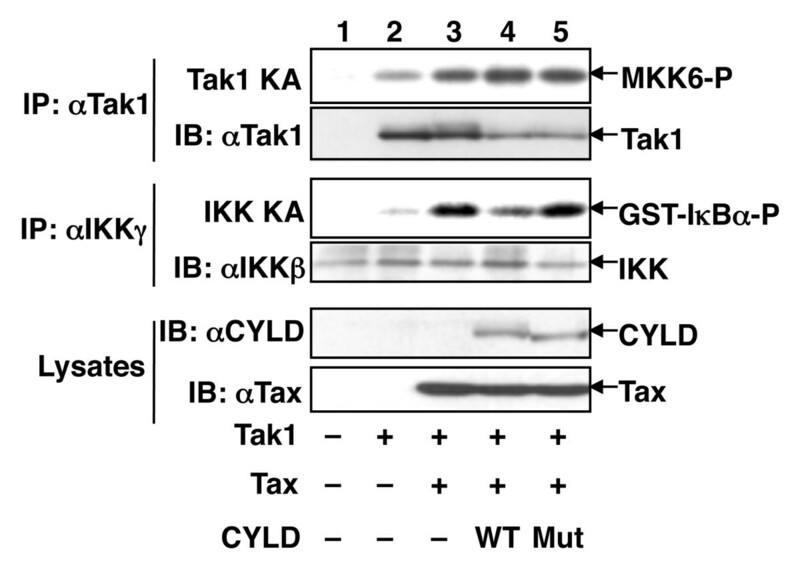 CYLD inhibits Tax-stimulated activation of IKK but not that of Tak1. HEK293 cells were transfected with the indicated expression vectors. Cell lysates were subjected to in vitro kinase assays to detect the activation of endogenous Tak1 (panel 1) and IKK (panel 3). Following autoradiography, the kinase assay membranes were subjected to IB to detect the Tak1 (panel 2) and IKKβ (panel 4) proteins. The expression level of CYLD and Tax was monitored by IB (panels 5 and 6). The catalytic activity of CYLD is negatively regulated by its phosphorylation . In response to cellular signals, CYLD becomes transiently phosphorylated and inactivated, thus contributing to the activation of IKK. Since Tax stimulates persistent activation of IKK, we examined the status of CYLD phosphorylation in a large panel of T-cell lines transformed by HTLV1 or Tax. As expected, the level of IκBα (a primary target of IKK) was low in these HTLV1-transformed T cell lines (Figure 4). Remarkably, in all of these Tax-expressing cell lines, CYLD was detected as two bands in IB assays (Figure 4). As previously observed in mitogen-stimulated T cells, the upper band represented the phosphorylated CYLD, since it was converted to the basal form upon in vitro phosphatase treatment (Figure 4). Thus, CYLD undergoes constitutive phosphorylation in HTLV1-transformed T cells. Constitutive phosphorylation of CYLD in HTLV1-transformed T cells. Whole-cell lysates were prepared from control Jurkat T cells or the indicated Tax-expressing (Tax+) T cell lines transformed by Tax (Tax1) or HTLV1 (C8166, SLB-1, E55, HUT102) and subjected to IB using anti-CYLD (upper) or anti-IκBα (lower). In lanes 7 and 8, the cell lysates were incubated in vitro with either buffer or calf intestinal phosphatase (CIP) to show that the more slowly migrating protein band is phosphorylated CYLD. To assess the role of CYLD phoshorylation in regulating its catalytic activity, we examined the effect of a phospho-mimetic CYLD mutant on Tax ubiquitination. As expected, the wildtype CYLD, but not its catalytically inactive mutant, efficiently inhibited Tax ubiquitination (Figure 5, lanes 2 and 3). Importantly, a phospho-mimetic CYLD mutant harboring serine to glutamic acid substitutions at the phosphorylation sites (CYLD7SE, see ref. ) completely failed to deubiquitinate Tax (Figure 5, lane 5), whereas a mutant harboring serine to analine mutations at the phsphorylation sites of CYLD (CYLD7SA) remained active in Tax deubiquitination (Figure 5, lane 4). Thus, in HTLV1-transformed T cells, CYLD is inactivated via constitutive phosphorylation, which may contribute to the aberrant activation of IKK and NF-κB. A phospho-mimetic CYLD is defective in inhibiting Tax ubiquitination. HEK293 cells were transfected with Tax and HA-ubiquitin either in the absence (-) or presence of wildtype (WT) CYLD, the catalytically inactive CYLD mutant (Mut), or CYLD mutants harboring serine-to-alanine (SA) or serine-to-glutamic acids (SE) substitutions at its phsophorylation sites. 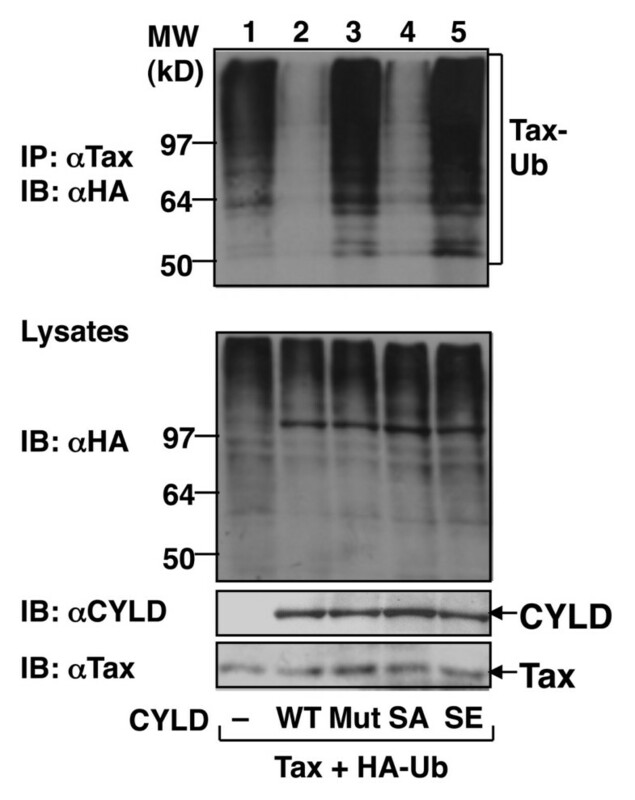 Cell lysates were subjected to Tax ubiquitination (upper) or direct IB to analyze the expression of ubiquitin, CYLD, and Tax (lower three panels). The data presented in this paper demonstrate a role for CYLD in regulating the ubiquitination of Tax, oncoprotein of the leukemia virus HTLV1 . CYLD is physically assembled into the Tax complex and involved in negative regulation of Tax ubiquitination and signaling function. Furthermore, Tax and CYLD appear to mutually regulate, since CYLD is constitutively phosphorylated in HTLV1-transformed T cells. Strong evidence suggests that Tax ubiquitination plays a critical role in its signaling function in the NF-κB pathway . Indeed, we have shown that CYLD-mediated Tax deubiquitination is associated with attenuation of IKK activation. Similarly, the ubiquitination and function of Tax are also regulated by another deubiquitinase, USP20 . These findings suggest that ubiquitinated Tax may be targeted by different deubiquitinases, although precisely how the different deubiquitinases regulate Tax during HTLV1 infection remains to be further studied. Our current study demonstrates that the CYLD-mediated Tax deubiquitination did not affect Tax's ability to activate Tak1. This finding suggests that Tak1 activation is insufficient for Tax-mediated IKK activation, implicating the involvement of different mechanisms in Tax activation of Tak1 and IKK. In further support of this idea, our previous work demonstrates that a Tax mutant, TaxM22, is capable of Tak1 activation despite its defect in IKK activation . One possibility is that Tax not only activates Tak1 but also recruits Tak1 to the IKK complex to mediate IKK activation. Future studies will examine whether Tax ubiquitination is required for recruiting Tak1 to IKK. The catalytic activity of CYLD is negatively regulated by its phosphorylation . Cellular stimuli induce transient phosphorylation of CYLD, which may contribute to the optimal activation of IKK. A remarkable finding in the present study is that CYLD is constitutively phosphorylated in a large panel of HTLV1-transformed T cells. Since a phospho-mimetic CYLD mutant is defective in inhibiting Tax ubiquitination, the CYLD phosphorylation may contribute to the chronic activation of IKK and NF-κB in HTLV1-transformed T cells. We have previously shown that induction of CYLD phosphorylation by TNF-α or mitogens is mediated by the IKK complex . However, we found that in HEK293 cells, Tax was insufficient for the induction of CYLD phosphorylation (data not shown). This result could be due to the low expression level of IKK components, particularly IKKγ , although the possibility for involvement of additional signaling factors cannot be excluded. Regarding the latter possibility, a recent study suggests that CYLD phosphorylation can also be mediated by the IKK-related kinase IKKε and contributes to IKKε-induced tumorigenesis . Whether IKKε is involved in the CYLD phosphorylation in HTLV1-trnasformed T cells is yet to be investigated. It also remains to be examined whether CYLD phosphorylation also contributes to HTLV1-induced T-cell transformation. Nevertheless, our data suggest that CYLD phosphorylation is a mechanism that mediates constitutive Tax ubiquitination and signaling function in HTLV1-transformed T cells. The results of this study demonstrate a role for the DUB CYLD in the negative regulation of HTLV1 Tax protein. 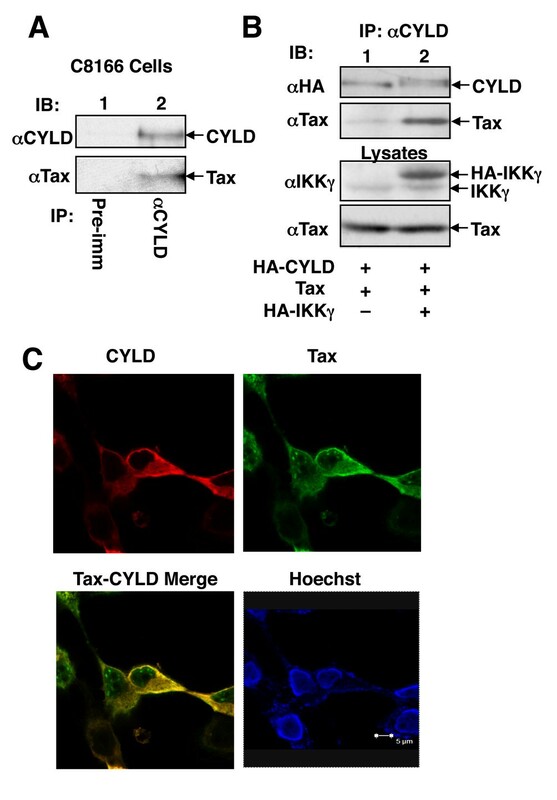 CYLD inhibits Tax-stimulated IKK activation via deubiquitinating Tax, although the CYLD-mediated Tax deubiquitination does not affect Tax activation of Tak1. Our data further suggest that HTLV1 has developed a mechanism to override the negative-regulatory role of CYLD, and this mechanism involves the induction of CYLD phosphorylation. Human embryonic kidney cell line 293, human leukemia T-cell line Jurkat, and HTLV1-transformed human T-cell lines were described previously . The Tax1 cell line is an IL-2-dependent human T-cell line immortalized by HTLV1 Tax in the context of a herpes saimiri vector . For transient transfection, 293 cells were seeded in 6-well plates and transfected using Lipofectamine-2000 (Invitrogen). pCMV4-Tax was kindly provided by Dr. Warner Greene . pcDNA-based expression vectors encoding HA-tagged IKKγ, Ubiquitin, CYLD, a catalytically inactive CYLD mutant (CYLDmut) were as described [14, 22, 41]. CYLD SA is a phosphorylation-deficient mutant harboring alanine substitutions of seven serine residues, and CYLD SE is a phospho-mimetic CYLD mutant harboring serine to glutamic acid substitutions . Ubiquitin mutants K48 and K63 (provided by Dr. Zhijian Chen) carry lysine-to-arginine substitutions in all lysine residues, except K48 and K63, respectively. Ubiquitin mutants K48R and K63R harbor mutations in lysine 48 and 63, respectively. pCMV-HA-Tak1 expression vector and anti-Tak1 antibody were kindly provided by Drs. Kunihiro Matsumoto and Jun Ninomiya-Tsuji . All other reagents were described previously . Cell lysates were prepared by lysing the cells in RIPA buffer for IB and IP . For kinase assays, cells were lysed in a kinase lysis buffer supplemented with phosphatase inhibitors and immediately subject to in vitro kinase assays as described previously . For ubiquitination assays, cells were transfected with HA-tagged ubiquitin or its mutants along with other expression vectors. The cells were lysed in RIPA buffer supplemented with 4 mM N-ethylmaleimide (NEM) and immediately bioled for 5 min in the presence of 1% SDS and then diluted 10 times with RIPA buffer. Ubiquitinated Tax was isolated by IP using anti-Tax and detected by IB with anti-HA. HEK293 cells were transiently transfected with HA-CYLD and Tax and subjected to indirect immunofluorescence assays as described . Xuefeng Wu, Minying Zhang contributed equally to this work. We thank W.C. Greene for Tax expression vectors, Drs. Jun Niomiya-Tsuji and Kunihiro Matumoto for Tak1 antibody and expression vector, and AIDS Research and Reference Program of NIAID for anti-Tax hybridoma. This study was supported by National Institutes of Health grant AI064639. XW and MZ designed and carried out the experiments and analyzed the data. SCS wrote the manuscript. All authors read and approved the final manuscript.